Today we’d like to introduce you to Valerie Ostenak. Valerie, we’d love to hear your story and how you got to where you are today both personally and as an artist. Growing up I was always involved in creative pursuits: drawing horse pictures in grade school for my friends during study hall and getting in trouble for it, savoring colors in the magical 64 Crayola box, and learning shading in paint-by-number horse pictures. Art was just a regular part of my everyday life, I was always making something. But I wanted to be a zoo veterinarian, I liked animals! High school was geared toward the sciences, and taking art classes as electives. My first semester in college was the first time I was without an art class, ever. I had filled my 16 unit course load with science, this seemed like a good idea. By the beginning of my second semester freshman year, everything was going along smoothly until my phylogenetic biology lab class when the instructor passed around boxes of tiny bones . . . and all I could think of was what I could make out of them. They were beautiful! When he asked if there were questions from the room, I raised my hand and very seriously asked where I could buy delicate bones like these because I wanted to make things out of them. He was not amused and sternly declared that this was a class for biology majors not artists. I told him I was both. He was still not amused. I realized I was an artist, not a veterinarian. I switched my major and added a jewelry metalsmithing class to my schedule. 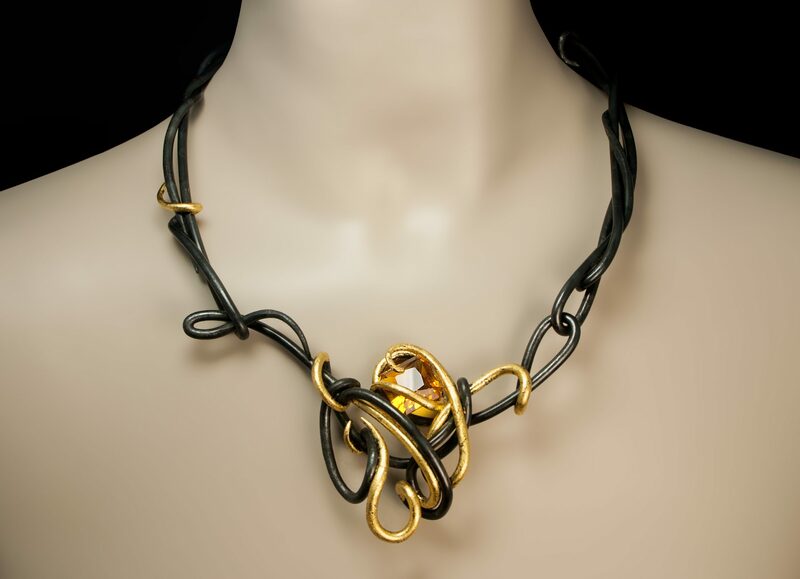 The instructor taught his classes with an emphasis on sculptural design and conceptual meaning. We were sculptors who worked in a small format . . . We were making Art. In 1971 there were an only handful of women working in metal. I had never worked in metal before, it seemed so unforgiving. 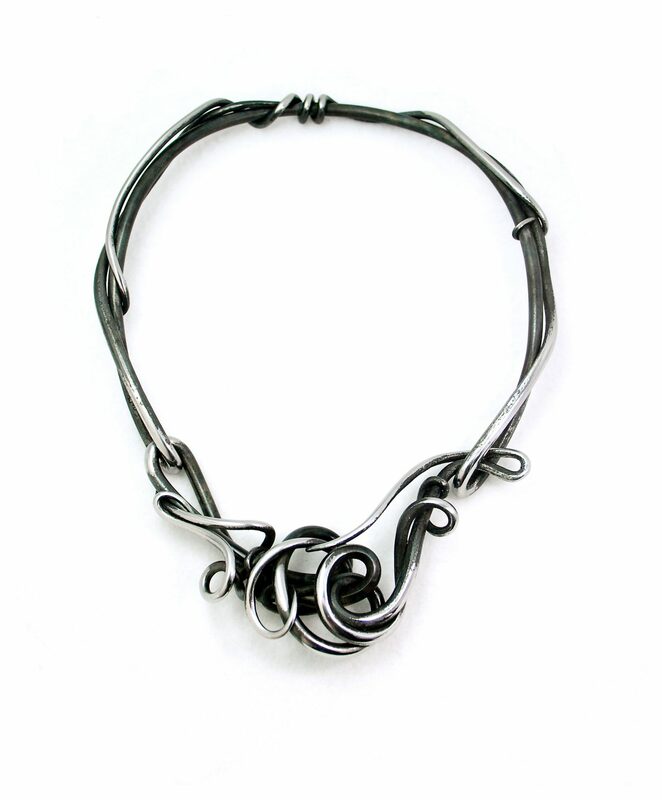 By the end of that first semester in jewelry, I had learned to listen to the metal, to feel it, and I found the flow in it. Over the years, the flow got deeper and stronger . . . I still love working in metal. “Art is my passion, the breath that I take everyday. It is the lifeblood of my heart and soul. My desire for those who see and wear my art is that it inspire them to live a passionate life. One in which they as well follow their heart and remain true to their Self. 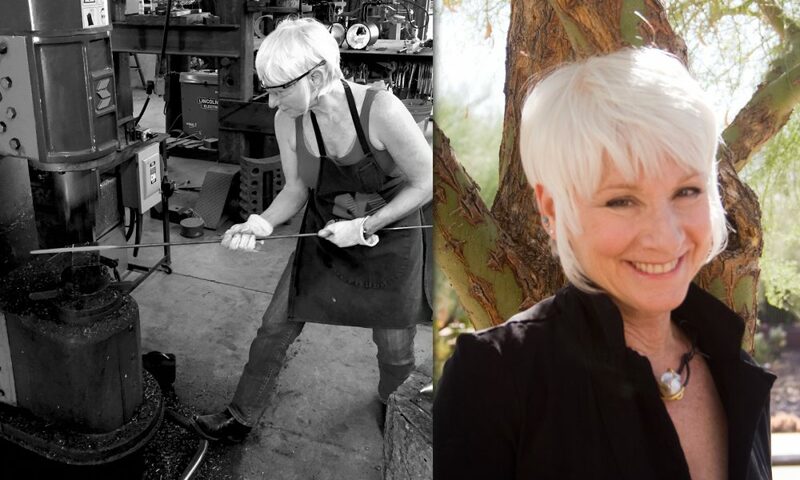 Become who you dream you can be.” ABOUT THE METAL: Valerie Ostenak, an award-winning metalsmith, creates fine sculptural jewelry in steel and silver using the centuries-old technique of forging. Though metal, particularly steel, seems to be a hard and inert material, Valerie finds the flow within it. The steel she works must be yellow hot to be shaped and formed. In that moment of perfect yellow, the steel becomes soft and sensuous. Upon cooling, it remains in the graceful form she has created. 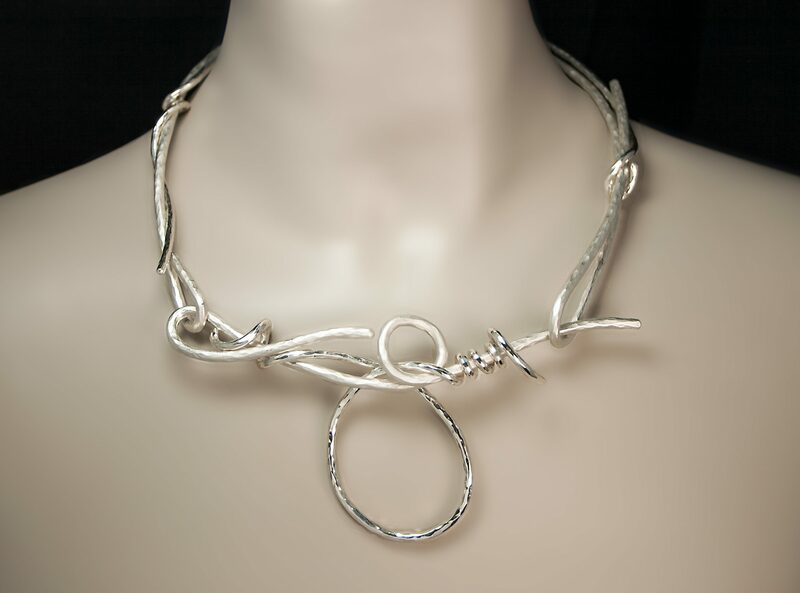 The sterling silver jewelry is worked cold. 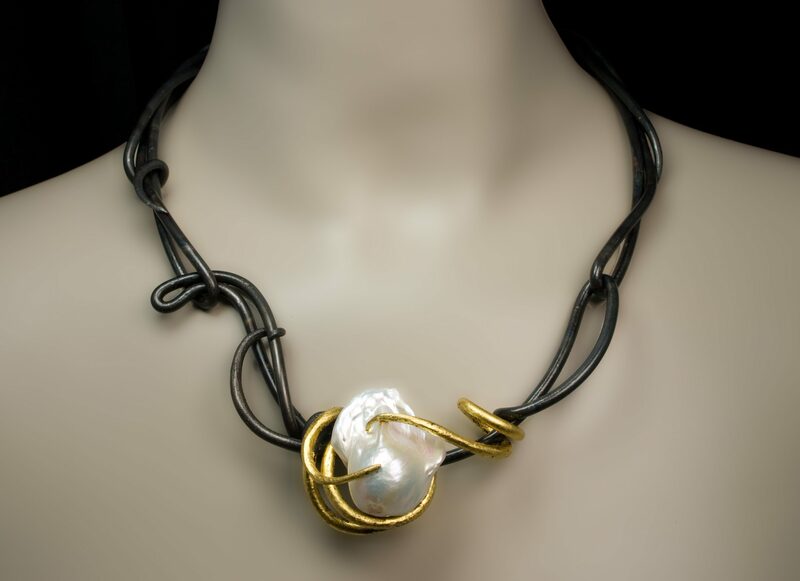 Each hammer blow creates the texture and flowing movement in the piece. Valerie leaves the marks from the hammer blows . . . bringing light and life to the silver. 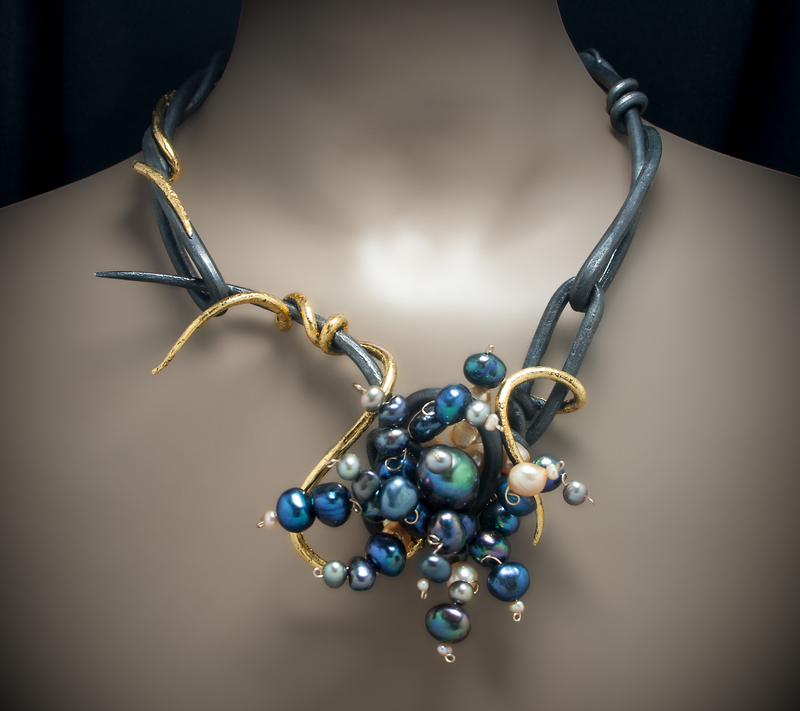 Neckpieces are formed to flow over a woman’s shoulders, resting in perfect harmony on the curves of her body. 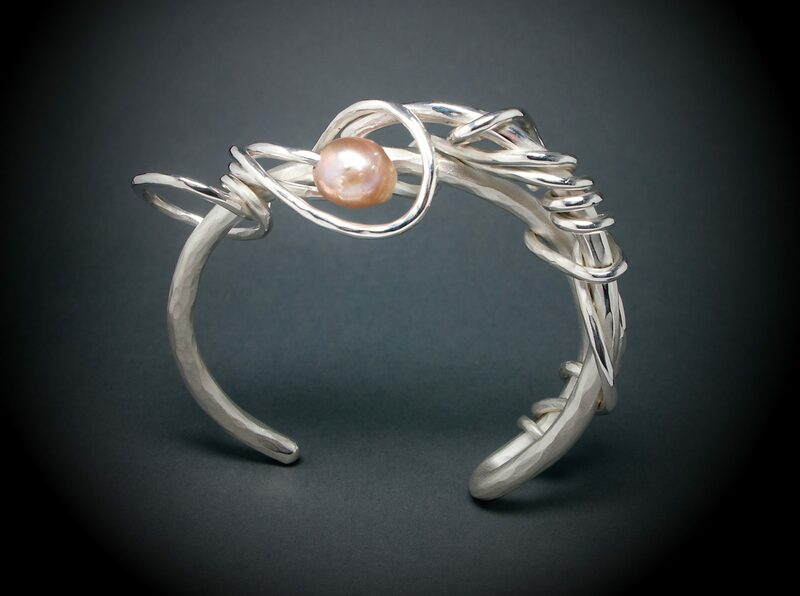 INSPIRATION: Movement and the energy behind it are the inspiration for her work, whether jewelry or paintings. The flow of vines and tendrils curling around each other, water in a stream bubbling over pebbles and stones, waves crashing on a rocky shore, or the wind moving clouds . . . each visibly recording change and growth. Even the breath of the Universe tuned in to our inner stillness is invisibly speaking to the transformation of our Self. 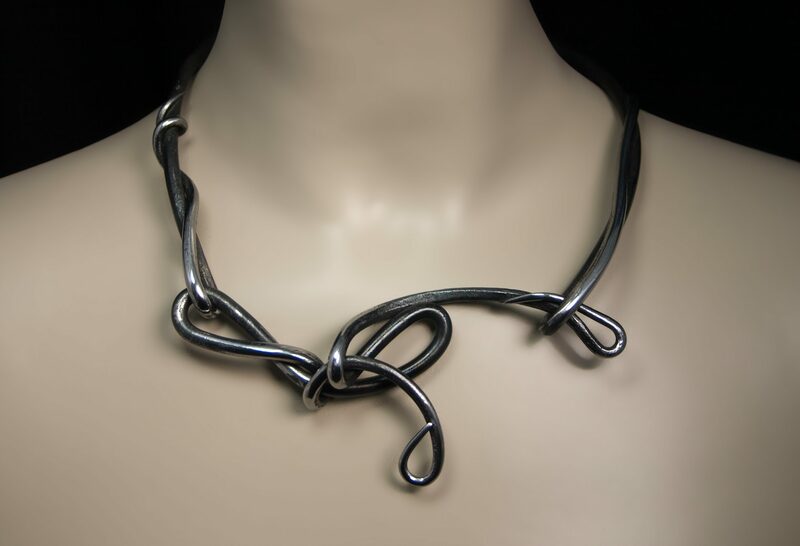 TRAINING: Having started her life in art with drawing and painting early on, Ostenak’s metals training began with jewelry and metalsmithing courses at Northern Arizona University in Flagstaff AZ, and continued at California State University Long Beach, CA. She has worked with private clients, interior designers, and architects, designing and creating art for them to wear, and to live with. Success is a very broad term loaded with fear & love, contentment & restlessness, acceptance & rejection. In its most neutral and kind form, success for me is having been able to get up everyday of my life knowing that I could walk into my studios and create whatever is in my mind. I believe that perseverance is essential to success as an artist. Perseverance is that spark of passion that leads me through the darkness and back into the light. When the light is shining brilliantly, perseverance takes me to the next level with new goals and plans. It is the passion to persevere that ultimately is essential. www.saatchiart.com www.valerieostenak.com squareup.com/store/valerie-ostenak A few exhibitions are in the selection stages… follow my Instagram for the info A pop-up store is in the planning. Follow my Instagram for the info as it evolves, sign up on my website for an email… I send them out MAYBE a few times a year, but would like to keep you up to date on shows or events if you’re interested. How can people support my work? Buy my art, share my art, send me love and good wishes, if you are a gallery or boutique: let’s talk, have a PR or special event idea: let’s talk, want to be a patron of the arts, let’s talk.